Out of town? Just east of centre actually. Still, even a short spell at this mixed-use Clerkenwell spot should provide you with a proper escape from the day-in-day-out London hustle. Real coffee, interesting vintage retail, a calm and understated place for catching up, chilling out, avoiding life or doing a spot of WiFi out-of-office work, Out of Town is a gem. And quite an affordable one too. 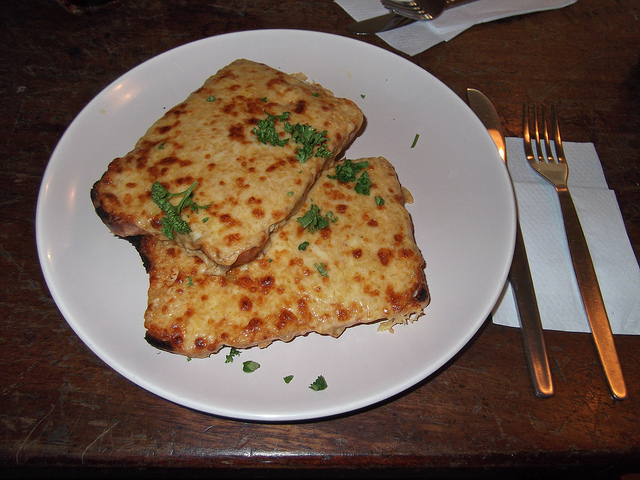 A humongous toasted ciabata costs around three quid and a strong contender for the best Welsh rarebit in London only runs you a little more. Coffee's cheap too and just as good as cuppajoes served at a few highly revered shrines of caffeine in the area (minus all the hype). And – cool thing this – if you like the table where you're seated or particularly fancy any of the artwork on the walls, there's a good chance the laid back and friendly OOT folks will sell it to you. One part sarnie bar, one part cafe and one part shop – a variety of vintage apparel, adverting, furniture, books and more provide a surprisingly refreshing backdrop for your lunch. Odds are there'll be some excellent age-old soul music spinning on precious vinyl during your visit as well. A wonderful place that we considered keeping to ourselves as a favoured secret hang out – a quick (or lingering) coffee or satisfactory and simple dine at Out of Town is well worth the little bit of money you'll spend there. Out of Town is located at 30c Great Sutton Street, EC1V 0AE. No web presence that we can find at the time of publication, OOT may be reached by phone at 020 7549 2168.